I actually posted this on my other blog Let's Start Saving Now but I thought some of you might like to read it, too. I know that this is only the tip of the iceberg on how to make money blogging, but it might help some of you. Of course, it might get motivated to do more. I get asked all of the time if I make any money blogging. 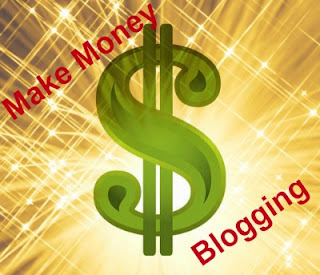 If I do, then they want to how I make money blogging. Well, the first answer is “yes, I do make some money blogging”. I don’t make a whole lot. I could probably do much better but I don’t want to feel like I’m only doing this for the money. I run into this conflict with my self more on my blog, Let’s Start Saving Now than on my other one Book Worm & More. Of course, I really haven’t done much on Book Worm & More, yet. I kind of feel like a fraud since I’m suppose to be trying to get readers to save money or get readers to save money or get freebies. Granted many of the affiliate programs have free samples of items, and coupons, but it still feels weird to me. Anyway one of the ways I make money on my blog is through affiliates like Escalate, and My Savings. I make money when someone prints a coupon, orders a free sample, or completes an offer through them. Most of the time, it is usually just a coupon or freebie. This is so I can keep my conscience clean. Nest I make money on some of the ads on my page. Again, I don’t really have many of these but I’m thinking about changing that, so, I can continue blogging. In some instances, I make money when someone click on the ad. In others, it may be based on how many visits I have to my page. And finally, someone might pay outright to put an ad on my page. I don’t have any of these right now, but I’m thinking of doing some for the Christmas season (as long as it is something I like ). Also, I make money when someone clicks on my Amazon links and purchases something. It doesn’t have to be for the item that you originally clicked on. And, no it doesn’t cost you anything. I just get a commission. If they didn’t pay it to me, they would pay it to someone else. This is called the Amazon Associates Program. I even have a dedicated page for Amazon sale items, but I don’t really promote it. I guess I need to start doing that. Then there are sponsored posts. Most of the ones I’ve done are through Social Spark. They are great to work with. I’ve also used Pay Per Post. There is another one called Blogvertise, too. However, many of theirs don’t always fit with my blogs. For all of these companies, they give you a topic to write about and you have to include a link that they provide. You have the option to decide if it pays enough for your time, or to negotiate the price. I’ve also been contacted by individuals/companies to write sponsored posts. Occasionally, I will get paid to a book review, but most of the time I do these as part of a book tour. With all book reviews, I am provided a free copy of the book, and I only do those that I’m genuinely interested in. I don’t make money on this next one, but it is a nice perk. I get items to review. I love these, and I’m looking forward to doing more. These are usually items that companies come to me with, but I’ll probably approach some companies over the next couple of months to include in my Holiday Gift Guide. I do make some money that isn’t really blog related. My absolute favorite way is with Swagbucks. I don’t get cash. I could get money sent to my Pay Pal. It just takes more points than the Amazon gift cards. I pretty much use all of my points for Amazon gift cards. The best thing is I don’t do anything different, except that I use Swagbucks as my search engine. Every so often it will pop up and say I won some points when I’m searching for something. Of course, they have many, many other ways to earn points. I’ve gotten $100’s in Amazon gift cards. In the past couple of months alone, I’ve cashed in for about $60. You can get some great gifts with these. I guess I will be using mine to get a new Kindle since mine broke. Also, I make a little bit here and there with some survey companies. The only one I’ve really used lately is Pinecone Research. I love them. You get paid with a couple of days, there is no threshold to meet, and occasionally you get samples to try. If you get samples, you will be paid to do another survey on the item you received. Most of the time, the samples are really full-size products. I’ve also used Inbox Dollars and Panda Research. I just haven’t found the time or the inclination to do many other surveys, lately. So, the answer is yes, you can make money. I’m not making much right now, but I guess I will work on that. I just don’t want to become a blog with just affiliate links and ads. Of course, I don’t mind if you check out the ads on my page, check out what Amazon has on sale through my site, read my sponsored posts, click on my links, print coupons, etc. I know there are many other ways to make money, and one of these days I might check them out when I’m not searching for freebies, savings, samples, etc. I hope that I have answered some of your questions. If you have any other questions, or want to share other ideas on how to make money blogging or online, let us know in the comments. Thanks for the info. I am doing some of these but am new to the others. Thank you!